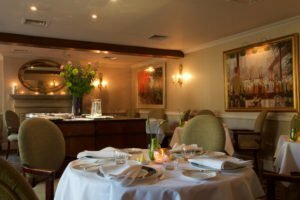 There’s no greater gesture or way to celebrate a special occasion or anniversary than by joining us at Lords of the Manor to dine privately. 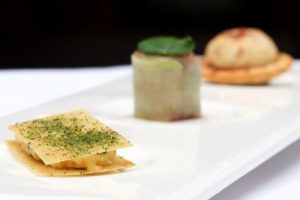 Suitable for parties of up to 60 guests, our menus have been carefully designed to offer widely acclaimed food that can be enjoyed in the main restaurant. Should you require a party of up to 90 guests, we can transform the space so that dining can be taken across two separate rooms. For events up to 150 people, we hold marquee events. Our public areas are routinely decorated with beautiful, fresh floral arrangements that can be added to at your request; please contact us and our florist will be in touch. Our event planners can advise on music, including harpists and string quartets – the team also includes our renowned Pastry Chef who can make you a Chocolate Mousse centred with Mango & Passion Fruit, Lemon Butter Cream Cake covered with Traditional Icing or a Strawberry, Vanilla and Almond Torte. Please grant us 48 hours’ notice for cake requests, prices start from £6.45 per person. From flowers and music to celebration cakes and extra touches, we can provide the perfect ambience for your celebration at Lords of the Manor. 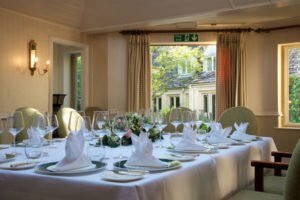 Please browse the menus below and select one starter, a main and a dessert for your party and you will see why there is no finer place to enjoy private dining in the Cotswolds. All public areas at Lords are decorated with fresh floral arrangements. However, if you would like additional floral decorations to suit your colour scheme then we will be pleased to arrange this for you. Alternatively, you can meet with our florist who can help with ideas and prices. With our resident guests kept in mind, there are certainly options concerning music from a string quartet or harpist – or simply your own selection of music – our event planner will be happy to advise. We are able to bake a cake for one guest, or up to 10 guests and prices start from £6.45 per person. We kindly ask for a minimum of 48 hours notice. For larger parties, please call us to discuss.